Troy “Trombone Shorty” Andrews is an internationally renowned trombone and trumpet player who leads his band Trombone Shorty & Orleans Avenue. He lives in New Orleans. Bryan Collier is an acclaimed illustrator who has won three Caldecott Honors and five Coretta Scott King Awards. He lives in Upstate New York. "Fans of Andrews’ Trombone Shorty (2015) will cheer over Shorty’s illuminating return." "Andrews's second collaboration with illustrator Bryan Collier is, indeed, something beautiful . . . Troy Andrews's tribute to New Orleans and the music it has created is melodious and invigorating. Bryan Collier's visual interpretation carries the audience along on a distinctive and beautiful parade, much like the popular musical parades of New Orleans. The combo of text and illustration is well-tuned, and readers of any age are sure to find themselves thoroughly entertained." 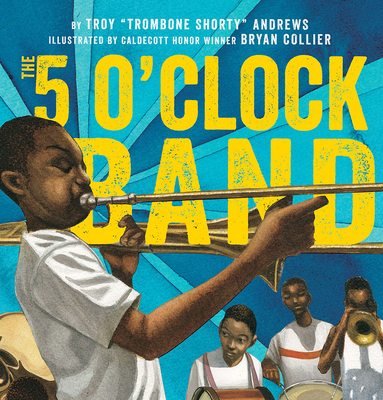 "In this beautiful companion to the award-winning Trombone Shorty, the author shares his love and appreciation for his hometown of New Orleans and the musical heritage that exists there . . . Collier’s exquisite artwork rendered in pen and ink, watercolor, and collage brings readers into the heart of the city that Andrews so dearly loves. These complex and layered illustrations complement the story perfectly, honoring the vibrancy of New Orleans." "Collier's characteristic collage illustrations effectively represent Troy's emotional struggle for self-improvement, and the level of detail in the images portrays the liveliness of New Orleans well . . . An excellent story about a man who remembers the community he came from and actively works to ensure its future success." "The author’s affection for New Orleans flows through his writing, and Collier’s collage-filled, textural paintings capture the rhythm and spirit of the city." "The impulse is to linger on the page to soak in the warmth of the illustrations as much as it is to exclaim “Where y’at!” every time that phrase appears in the dialogue."